What is there to do around Royal Tunbridge Wells? My husband and I were given a really nice present by my daughter. It was a steam train ride on the Spa Valley Railway with afternoon tea at a nice hotel included! There is something about steam trains that’s very nostalgic and anybody who is into vintage items or history would enjoy a day out exploring the Kent countryside in this way. But even if you’re not into steam trains, it’s a fantastically leisurely way to see the countryside around Royal Tunbridge Wells. The drive from Surrey through to Kent couldn’t have been more pleasant. Kent has a stunning countryside, from lush green fields to dark impenetrable forests, and this was just what we saw from the car! We arrived at the Tunbridge Wells West station and took a look at the trains and the railway museum. I recommend you look up the train timetables on their website before you go, as they can vary. The Spa Valley Railway advertises itself as a railway with a ‘destination at every station’ and they are not wrong! Once we boarded the beautiful old carriage, the train slowly chugged along and stopped at several stations on the way. All of them have interesting sights worth seeing (again their website gives plenty of detail) but we were especially impressed by the ‘High Rocks’ station. There was a lovely Restaurant there too, but we stayed on the train and took in the sights from the comfort of our dry carriage, as by then it had started to rain. However, you can hop off and on at any station and go sight-seeing, which is especially good if you have children, as there is a lot to do and see for families. At High Rocks station you can access the High Rocks, which is a magnificent scenic walk through woodland and features acres of sandstone rocks interlinked with eleven bridges. It is believed they were once a stone age camp, and now they are a National Monument. We saw so many families with children having a great time exploring and having picnics (before it started to rain). Once we hopped off the train, it was time to make our way to the Mercure Hotel Tunbridge Wells for our afternoon tea. The hotel was lovely, although a bit far from the Spa Valley Railway. If you’re not going by car, it could be a bit tricky getting there. I can’t comment on the hotel itself as we didn’t stay there, but the afternoon tea was very good and the staff couldn’t have been more friendly and helpful. We had a great selection of pastries and cakes (not forgetting scones) and a choice of tea or coffee. There was a wedding reception taking place there at the time and it seemed like a very popular choice of venue. We left the hotel just as the bride and groom left on a London double-decker bus with the guests following behind in their decorated cars. 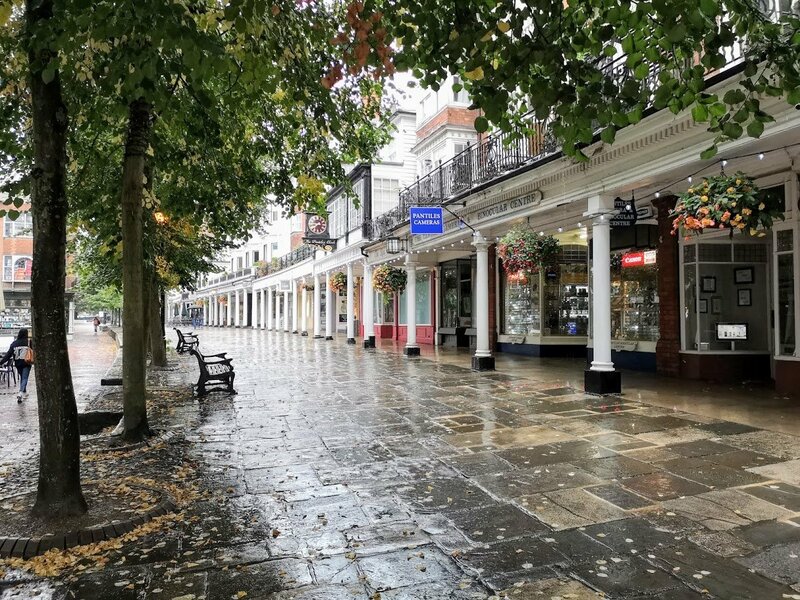 The Pantiles is in the centre of Tunbridge Wells and is an area dedicated to art galleries, cafés, bars, restaurants and specialist shops. It was formerly known as The Walks and The Parade and is now a tourist destination. People can enjoy Jazz nights during summer and there is a farmers market every other Saturday. I love the Georgian architecture, and the whole area, although gentrified, has managed to retain that old world charm. It was raining on the day we visited, which meant the streets were empty. There are lots of hotels in Tunbridge Wells and I’m so glad we stayed at the One Warwick Park. This hotel is very conveniently located, a very short walk from the centre. The only drawback is that it hasn’t got a dedicated car park, but as it was a Sunday, we were able to park in available spaces on the same road. The hotel itself is modern, clean and luxurious. The staff was extremely helpful and friendly, nothing was too much. The room was very spacious and beautifully decorated. The bed was so comfortable, just what we needed after a busy day exploring the town and surrounding countryside. The hotel also has a very nice restaurant, which we used for breakfast in the morning. The food was delicious, we had wide choice and decided on the continental breakfast and eggs Florentine. So good! We had a very enjoyable time in Tunbridge Wells and we could have done even more with better weather. As a day out, it does tick all the boxes. Let me know if you have been to Tunbridge Wells in the comments!